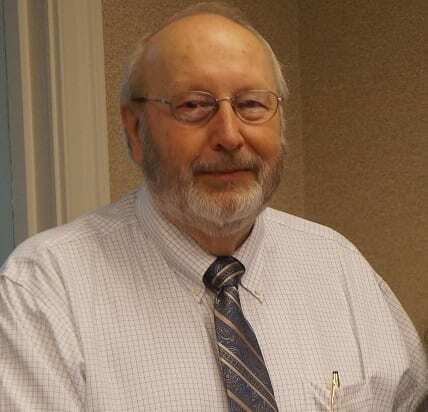 ELLIJAY, Ga. – The Gilmer County Board of Commissioners Chairman Charlie Paris officially announced at the May BOC meeting that he received word that the State DOT (Department of Transportation) program replacing bridges across the state will move the Lower Cartecay Road bridge further up the list. Paris told those at the meeting that he had contacted Georgia Speaker of the House David Ralston about interceding on the county’s behalf to get the bridge added to the list. He stated the Speaker’s help in the county’s sudden need was integral to the process that has now seen the bridge added to the list and moved to a priority position. Having received a Memorandum of Understanding from the DOT for Vanilla Lane, the commissioners discovered that while they were originally estimating their half of the costs of obtaining the right of way to be somewhere around $15,000 to $20,000, the official estimation of the total costs according to the memorandum would be $207,000 bringing Gilmer’s half to $103,500. Now the county will be looking at another memorandum in the coming weeks for the Lower Cartecay Road bridge since it has been moved up. Aside from the movement of Lower Cartecay, Paris recommended the Board move forward with sending the $103,500 to the DOT for Vanilla Lane to keep it from being dropped from the list. As the county moves forward with both bridges it will be awaiting news on both sides as they find out if Vanilla Lane does maintain its position on the list and the progress of site visits and preliminary work on Lower Cartecay Road. Officially approved by unanimous decision, Paris stated the excess expense will be funded out of the capital contingency fund as the expense was larger than expected. Previously, during budget sessions last year, the members of the board discussed dedicating their entire capital contingency to be saved for replacing Lower Cartecay Road bridge if it was unable to be added to the programs list. It was stipulated as a “back-up plan” to ensure the funding would at least begin the process of saving for the replacement while the commissioners were hoping to add the bridge to the DOT program. Now, with the bridge not only added but moved up the list, the contingency fund appears as if it will be used to fuel both bridges at a substantially lower cost. Paris stated in the meeting that with the original estimate the board received on the Lower Cartecay bridge replacement rising past $1,250,000, any “reasonable figure” the DOT provides for the costs of right-of-way would be a vast improvement worth supporting. Additionally, if the county had not gotten onto the list with Lower Cartecay, they would have been saving their entire contingency funds for at least 2018 and 2019 pushing back the project to begin, at the earliest, in 2020. Now, this program places the Lower Cartecay bridge at the number one slot. Even with the late start, the project will begin its process with engineering and architecture this year. Citizens could potentially see construction beginning as early as next year. ELLIJAY, Ga. – It has been several months since Gilmer County’s budget session where the Board of Commissioners set aside contingency funds in their capital budget with the idea that they would not be there this year unless they could find funding to replace the Lower Cartecay Road bridge. 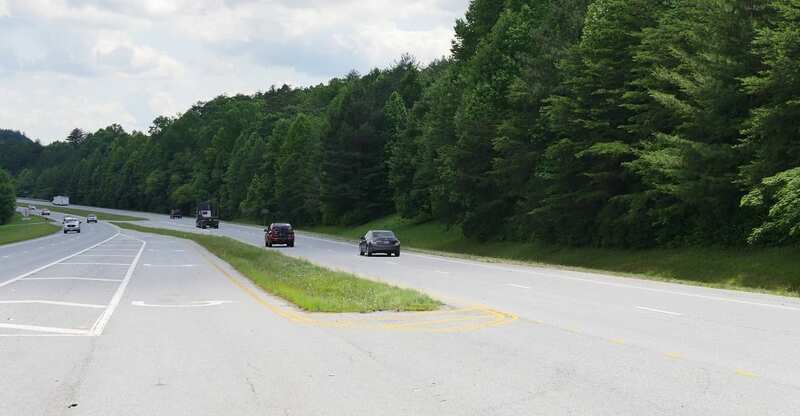 Good news came during the county commissioners meeting when Chairman Charlie Paris officially announced that Gilmer County has been accepted into the Georgia Department of Transportation (DOT) program it has been applying for. This means that the DOT will come and replace the bridge along with numerous others across the state. The original estimate that Gilmer received to replace the bridge was $1.2 million. With this program, Gilmer will be responsible for pairing 50 percent of the costs to obtain additional rights of way, which is a “minimal cost” as Paris stated in relation to the original estimate. Post 2 Commissioner Travis Crouch asked if the county could do any preliminary work to fast track the project. Gilmer will be in contact with the DOT to see if they can prepare any work ahead of time. The one “catch” in this approval is that it will fall into the state’s schedule, meaning it still could be some time before Gilmer sees the bridge replaced. This is actually the second bridge the county will have on the program as the bridge near Turniptown on Vanilla Lane has previously been approved some time ago. The commissioners discussed flipping their priority for the two bridges in effort to move Lower Cartecay up the list to an earlier replacement. Chairman Paris spoke with FetchYourNews privately about the issue saying that if we had not gotten into the program, we still wouldn’t be able to begin replacing it this year due to our budget. We would still need over $700,000 next year just to begin the project. CARROLLTON– GDOT moves Georgia! It can help set your career in motion too! If you are looking for an exciting, challenging, and professional transportation career, join Georgia DOT job fair in Carrollton Georgia. The Georgia DOT Northwest Georgia (District 6) Office will host a job fair from 9 to 11 a.m. on Tuesday, February 20 at the Carrollton Goodwill Career Center, located at 1301-D South Park Street, Carrollton, Georgia 30117. The District Office plans to hire entry-level maintenance professionals. All applicants must be at least 18 years old, with a high school diploma or a GED, and a have a valid Class C driver’s license. “The Georgia DOT District Office in Cartersville serves 17 counties in northwest Georgia. We maintain five major interstates and many state routes. 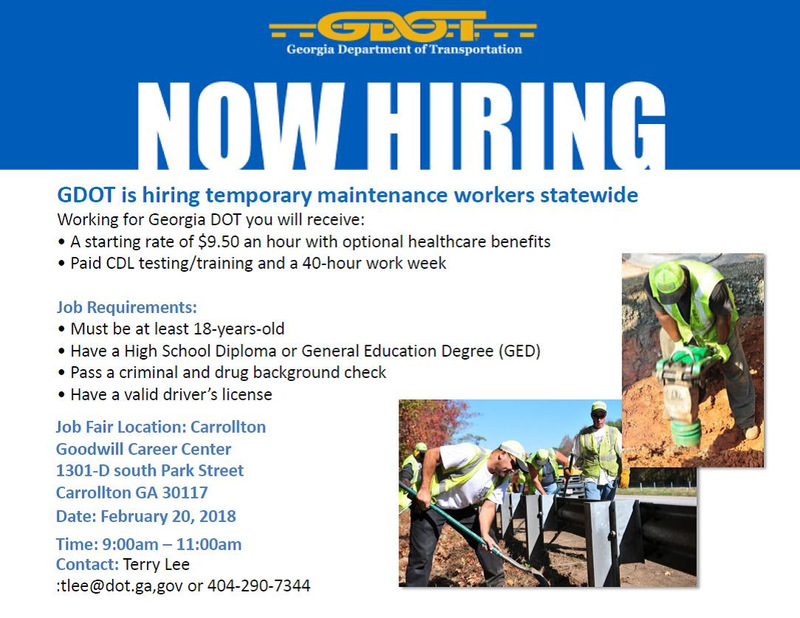 We are seeking eager and dedicated applicants to maintain the roadways,” said Terry Lee, regional recruiter at the Georgia DOT Office of Human Resources. “New hires will receive on the job training in various maintenance duties. Applicants are encouraged to wear business casual attire and bring several copies of their resumes. Contingent job offers will be presented to the most qualified applicants the same day. New hires must obtain a Georgia Commercial Driver’s License (CDL) within six months of employment. For more information about the job fair, please (404) 290-7344. Job seekers can also apply online at www.Team.Georgia.gov/careers, or complete an application at the Georgia Department of Transportation – Buchanan Office, located at 4323 US HWY 27, Buchanan, GA 30113. ELLIJAY, GA – Citizens have been talking for years about the intersection of Whitestone Road and Highway 515. A new chapter is underway as citizen, Gary Ferguson, asked for it to be put on the agenda for the Commissioners October 2017 Meeting. While Ferguson originally spoke about prohibiting trucks on Whitestone Road, the Commissioners quickly included the effects the prohibition could have on the Whitestone / 515 intersection. Ferguson’s main complaint is that the trucks are coming across the county line from Pickens for the access to the Highway. In doing so, they are allegedly speeding along the road through a small community causing dangers. Ferguson reported to the Commissioners that the trucks could be taking a road in Pickens to access Highway 515 that is a shorter distance, but they take his road due to a smaller hill providing less of an incline to climb. With the trucks loaded, they avoid the higher climb due to the added weight, according to Ferguson. One of the County’s major issues is sight distance on 515. Many will recall numerous accidents with fatalities at the intersection including a Deadly Tour Bus Accident in October of 2016. Post Commissioner Dallas Miller mentioned he wanted to talk with DOT about possibly placing a no left turn restriction on the intersection to help avoid traffic issues with all vehicles at the location. Post Commissioner Travis Crouch stated he would be meeting with a member of the Georgia DOT (Department of Transportation) and would discuss the issue. Coming back in the regular meeting, he noted the DOT representative stated Whitestone is a county road and the DOT would have no input on whether they prohibited certain traffic. DOT still could bring an engineer to the county to investigate the 515 intersection and safety issues involved with it. However, the Board of Commissioners indicated they were set to do more homework on their own and revisit the idea themselves in November. They officially tabled the motion in the October Meeting as they all wished to look further into different options. A Georgia DOT Maintenance crew will begin today to replace the obliterated and damaged reflective raised pavement markers on State Route (SR) 515 in Gilmer and Fannin counties. Work will proceed daily Tuesday through Friday from 7:30 a.m. until 5:30 p.m. This maintenance operation and the lane closures it necessitates are weather permitting and subject to change. Georgia DOT maintains over 2000 lane-miles in Northwest Georgia. Relatively harsh winter and snowplows used to clear the region’s interstates and state routes from snow and ice present a challenge to the DOT crews who are charged with maintaining lane markers on the roads. These crews follow Federal Highway Administration standards for markings and do their best to keep up. They also work almost continuously restriping faded markers and replacing missing reflective raised pavement markers. Still, the volume of traffic on the highways, snow removal in the winter and sunny summer all weigh heavily on the durability of the lane markers. Georgia Department of Transportation plans, constructs and maintains Georgia’s state and federal highways. We’re involved in bridge, waterway, public transit, rail, general aviation, bike and pedestrian programs. And we help local governments maintain their roads. Georgia DOT is committed to providing a safe, seamless and sustainable transportation system that supports Georgia’s economy and is sensitive to its citizens and its environment. Visit www.dot.ga.gov. For information on the Department of Transportation, visit http://www.dot.ga.gov. You also may like us on Facebook (www.facebook.com/GeorgiaDOT-Northwest) and follow us on Twitter (https://twitter.com/GDOTNW). Due to this, FYN has confirmed with Commission Chairman Paris that the bridge is closed at this time to public use. Authorities will be attempting to further inspect the bridge to see if it is possible for repairs, or if a full replacement is necessary. As for the closing of the bridge, Chairman Paris expects it will be weeks before it could be open due to the current condition. Paris assured FYN he would continue updates as decisions are made about the future of the bridge. Georgia State Patrol sends warning on placing homemade/advertising signs – It is illegal and will be enforced! FetchYourNews.com recently spoke with the Georgia State Patrol regarding individuals who are placing illegal signage on State Roadways and on State Road Signs. It is illegal and dangerous. 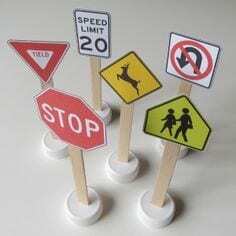 Road signs are engineered to breakaway in a safe manner if a motorist loses control of a vehicle and hits a sign. If someone places another sign, such as a homemade sign, on the structure, it changes the engineering and becomes a hazard. If you put up a sign on the roadway or in the median and someone wrecks it could put you in a position of liability to be sued for their injuries and damages. Georgia State Patrol wants to send the warning – if anyone is caught placing any signage on road signs or otherwise on the road illegally the law will be enforced with no exceptions. The idea is to keep the roads as safe as possible for travelers. Just because you have done so in the past doesn’t make it okay and violators will find themselves in trouble. If people have been warned and cited it may end up with an individual going to jail. No one may place, maintain, or display on, or in view from any highway an unauthorized sign, signal, marking, or device that purports to be or is an imitation of or resembles any official traffic control device (such as a stop or slow sign) that attempts to direct traffic movement or that hides from view or interferes with the effectiveness of any official traffic control device or sign. No one may place or maintain, nor may any public authority permit, commercial advertising on any highway traffic sign or signal. The state or local traffic authority with jurisdiction over the highway may cause any prohibited sign, signal, or marking to be removed without notice as a public nuisance (CGS § 14-310).